About Florida Lakes. Florida lake water color, water quality, water level fluctuations and conservation zones. Most people have a mental image of a Florida lake that is far different from reality. Many Florida lakes are shallow, weedy and contain dark or stained water. Our larger lakes, such as the Harris and Kissimmee Chains, are interconnected highways to the ocean that keep Florida from flooding during the rainy season. Most of our clear water lakes are spring-fed which makes them great for swimming. 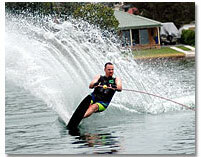 Most spring-fed lakes are not big enough for water skiing unless you enjoy skiing around in circles. There are some excellent waterskiing lakes in Florida, but lakefront land on these lakes commands a high premium because they are rare and very desirable. In recent years, developers have begun to advertise man made canals and rock pits as lakes to lure waterfront home buyers. Florida lake levels normally run in 5-10 year cycles of high and low water. In recent years drought and over development has caused the Clermont Chain to loose 10 feet of water. The Harris Chain is not substantially affected with fluctuations nearing 2-3 feet from year to year. Canals are a different issue. It is important to know the full length depth of a canal before you consider buying a specific canal front home or lot because you might find your boat hanging from your boat house for well over a year during a drought. You can not obtain this information from your average real estate agent, you must deal with someone who has first hand experience of a canal's depth during a low water period. 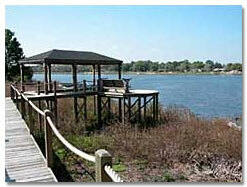 We specialize in Harris Chain lakefront property and have first-hand knowledge of the canal depths in all rain cycles. How do you locate hard to find Florida lakefront property?